This July 30, 2018 photo shows the Dorothea Dix Psychiatric Center, formerly known as Bangor Mental Health Institute in Bangor, Maine. The state’s proposal to pay for a new psychiatric facility in Bangor violates a decades-old court order that requires the state to continue improving its mental health services, says the former Maine Supreme Court chief justice who monitors the state’s compliance with the court order. 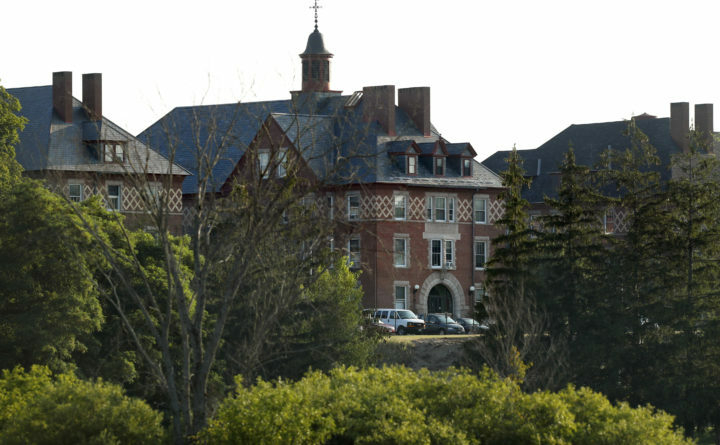 The Maine Department of Health and Human Services is proposing to redirect funding earmarked for a range of community mental health services to operate a secure, 16-bed psychiatric “step-down” facility in Bangor for people who no longer require the level of care provided at the state’s Riverview Psychiatric Center in Augusta, Daniel Wathen wrote in a document filed Tuesday in Kennebec County Superior Court. Wathen said the department’s use of about $5.4 million in funds the Legislature has allocated in recent years for mental health services provided in local communities violates both the Legislature’s intent and the terms of Maine’s Mental Health Consent Decree. The state would pay the $5.4 million to a contractor to operate the facility now under construction on the campus of the Dorothea Dix Psychiatric Center. “I find that the Department [of Health and Human Services] proposes to take action to encumber and expend funds in non-compliance with the Consent Decree and the legislative appropriations that provided those funds solely for the provision of core mental health community services for people who are not eligible for MaineCare,” Wathen wrote in the court filing. In 2008, Wathen recommended that Maine DHHS raise funds to support “eight core community mental health services” to comply with the consent decree, he wrote in this week’s filing. The Maine Legislature began appropriating those funds in the 2011 fiscal year. According to Wathen, DHHS has been negotiating with a private contractor, Correct Care Recovery Solutions, to operate the 16-bed forensic rehabilitation facility and is just days away from finalizing the contract. Correct Care provides health care in correctional facilities across the country, including a number in Maine. The proposal from Gov. Paul LePage’s administration is meant to ease the burden on the troubled Riverview Psychiatric Center in Augusta. Riverview lost its federal accreditation in 2013, in part because stun guns and corrections officers were used in the hospital. The new facility would house patients found not responsible for crimes they have committed or who are unfit for trial. A Maine DHHS spokeswoman did not respond on Wednesday to emailed questions about Wathen’s filing. LePage originally hoped to build the new facility in Augusta but decided to build it in Bangor after lawmakers blocked the proposal in 2016, saying they didn’t have enough information about the project. At the time, the administration said it could bypass legislative approval for the project by paying for it with internal Maine DHHS funds. The outgoing governor and his successor, Democratic Attorney General Janet Mills, have also clashed about the project. In early 2017, Mills’ office said that the administration would need legislative approval even if the agency could pay for it with internal funding. Earlier this week, LePage rejected a request from Mills’ transition team that his administration not enter into any new contracts before she takes office in January. On Wednesday, a spokesman for Mills did not directly comment on the contract for the step-down facility or answer whether the governor-elect had that contract in mind when she made the request to LePage’s administration. He also did not address her plans for the step-down facility as governor. Wathen did not respond to a phone call Wednesday. It was not clear how he learned of Maine DHHS’ plans for funding the Bangor psychiatric facility or whether his recommendation would affect those plans. The administration has shared few details about the project with the public. Two groups that advocate for Maine people with disabilities castigated the spending proposal detailed in Wathen’s filing. The consent decree that requires Maine to improve the services available to people with mental illnesses had its beginnings in the early 1990s, when residents of the former Augusta Mental Health Institute, or AMHI, sued the state over poor conditions and overcrowding, according to the Maine chapter of the National Alliance on Mental Illness. The resulting decree was meant to fund programs and services that would allow residents of AMHI, or later Riverview, to live outside an institutional setting. By redirecting funding from community services to the proposed Bangor facility, the LePage administration appears to be violating the intent of the consent decree, said Kevin Voydovich, an attorney at the organization Disability Rights Maine who represents plaintiffs in the class action lawsuit against the state. “The problem here is that these core community services are meant to keep people out of an institution,” Voydovich said. He added that it’s been hard to assess what services would be provided at the Bangor facility, given how tight-lipped the LePage administration has been. The Consumer Council System of Maine, a group that represents people with mental health problems, has opposed the creation of a step-down facility from the start. On Wednesday, the group’s executive director, Simonne Maline, echoed Voydovich’s concern about the report that funding for programs meant to help consent decree members stay in the community could go to such a facility. There is already a scarcity of psychiatrists who can prescribe medications in Maine — a fact that Wathen mentioned in his court filing this week — and other providers, Maline said. Any extra funding that’s been saved for consent decree members should go toward plugging those holes, she said.